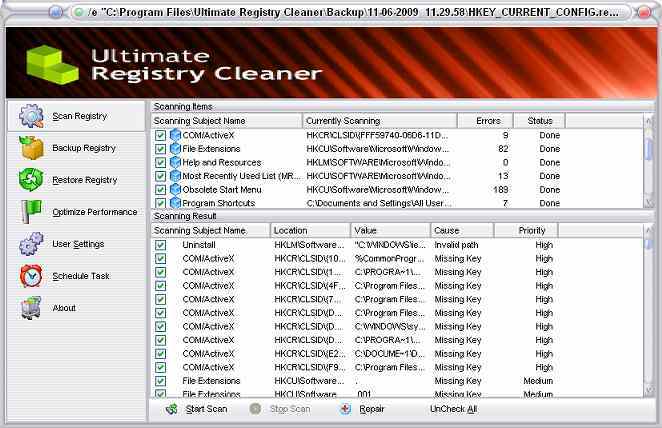 Ultimate Registry Cleaner gets to the Windows Registry, the dark heart of Windows. The registry is a bit like the boiler room in horror movies. And at least as scary. It holds all sorts of information – program settings (Microsoft’s programs and other ones as well), hardware settings (think hard drives, CD/DVD writers, graphics cards), most all of your user settings (it remembers where that window should open and what size it should be for instance). What can the Ultimate Registry Cleaner do? Uninstall programs often don’t tidy up properly after themselves. I’ve had to go into the depths of Regedit to fix problems occasionally and crossed my fingers before I made any changes. Anyone that has fought the registry before will have seen the dire warnings that if you get things wrong, your system could break, possibly horribly. In fact, the registry gets messed up seemingly as a matter of the natural course of things. Which is where registry cleaners come into their own. There are lots out there and they all make much the same promises: you’ll make your system work better and faster; you’ll experience less unexepected and unwanted crashes; your PC will get faster again because the registry isn’t hunting through hundreds of obsolete – or just plain wrong – entries. Ultimate Registry Cleaner makes much the same promises as the other programs. It runs a scan on your computer – you can run the scan for free, buying the software only if you want to fix the problems it will almost certainly find. I keep my machine fairly tuned but by the nature of testing things, I do install and uninstall programs. Ultimate Registry Cleaner took a couple of minutes to run andgave me a list of all the errors it had found. All 325 of them, split up into headings such as shared DLLs, program shortcuts, obsolete start menu items, file extensions and a heap of other things. Because the registry is so important to the working of Windows, you should always make a backup before making any actual changes. Just in case the worst happens. Ultimate Registry Cleaner offers both backup and restore options and it’s definitely worth making a backup before applying the changes it suggests. Then when you’ve done the scan and backup, it’s time to press the “repair” button. And if you want to be sure that the program has cleared all the errors it found, scan your machine again. I’ve done that with some registry cleaners I’ve tested in the past and they always seem to find at least one error in the time it took to fix. Which – being cynical – led me to question how much they were telling the truth about their numbers. But in the case of Ultimate Registry Cleaner, it gave a clean bill of health with no errors found. Ultimate Registry Cleaner works well. It does what it sets out to do quickly and efficiently. Most of the competition isn’t upfront about the cost of their program – always assuming you can find the price before you’ve downloaded the free scan and given away your email address. The prices I found for similar products ranged from $30 (renewable annually) to around $50. Which makes Ultimate Registry Cleaner a bargain even if you pay the price on the main page. But there’s also a discounted price which you can get here, making it an absolute bargain – half the price of the cheapest competitor I found and with lifetime updates included. These links will take you directly through to the purchase page, so check out the other links to see the features if you want to before deciding whether to use the Ultimate Registry Cleaner. This entry was posted in Computers on November 6, 2009 by Help Answer.